Flocations Corporate News and Information. Flocations.com releases the Flocations app in the Singapore App Store. 20 AUGUST, 2013 – SINGAPORE — The freshly released Flocations iPhone application extends flocations.com‘s travel package inventory of over 5,000 packages featuring more than 60 Singapore agencies to the iPhone. 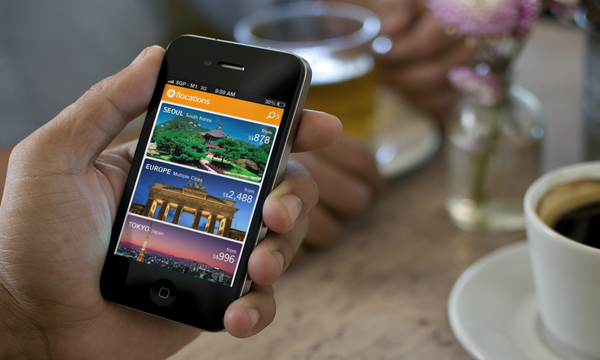 Available today on the Singapore App Store – www.flocations.com/iphoneapp – the Flocations app is a first for Singapore – allowing travelers to find and book travel packages from local agencies that are not usually available online. In regards to the decision of stepping into the mobile space, Venkat Dhamodaran remarks “40% of our visitors come from mobile”. Dhamodaran who is also a co-founder and product manager for mobile, “Mobile traffic is captured by our web application for any mobile phone accessing flocations.com. However, we have decided to give our iPhone users a smoother experience with a native iOS Application”. The iPhone application features the ability to search for travel packages from local agencies, one-tap calling, email and booking. Additionally, user can filter by price, duration, dates, map out destinations, itineraries, and explore media. Future versions of the application will also allow users to manage their favourite packages and agencies. This entry was posted in PR, Travel Agency and tagged iPhone App, Travel Package Search on August 20, 2013 by Flocations. What Travel Agency can learn selling travel product online? Ben on Flocations partners with NFC to increase fertility rate in Singapore.